Dinosaurs celebrate the holidays just like we do! In this innovative first concepts book, readers will see dinosaurs diving into Earth Day, Halloween, and more. 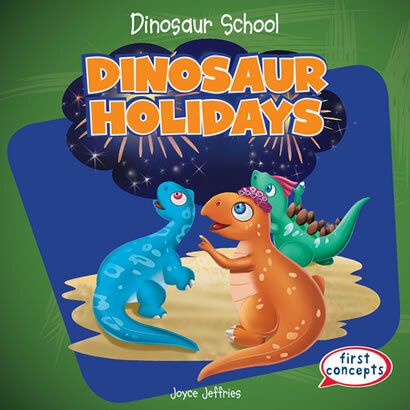 Dinos love to have fun on holidays, and readers will be thrilled by full-color illustrations depicting dinos gathering pumpkins, getting dressed up in Halloween costumes, and even seeing Fourth of July fireworks. Strong picture-text correlation helps readers establish early literacy skills, setting a foundation for future reading success with an engaging book that remains relevant throughout the calendar year.